I love this quote, this is from Christopher McCandless or maybe better known as Alexander Supertramp. 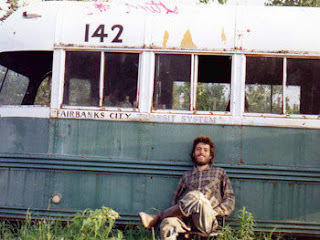 I wish when we were in Alaska we could have gotten a chance to follow the Stampede Trail to the "Magic Bus" he lived in and eventually died in during his journey into the wild. Here are the photos from our Alaska trip. We started with close to 1,000 photos and scaled them down to 172. The pictures don't even do this place justice, it really is one of the most amazing places on earth. There is so much untouched beauty here. In a world full of over consumption and over population it is reassuring to know there is still a portion of the planet that seems relatively untouched by humans. There is no litter or smog or crowds here, just nature, beautiful and preserved nature. The highlite of our trip was Amook Island where we spent three days in a primitive cabin where we washed dishes and took showers with rain water and took banyas every day. There were no cell phones, internet, or televisions. Mike and I were the only people for miles. Our guides stayed across the way on a separate island which was a 10 minute boat ride to our island. It was so peaceful. One morning we woke up to find 5 dear outside the cabin eating salmon berries. Even looking at the pictures now, I want to be back there setting up a camp fire or walking on the beach checking out the tide pools. It is one of the best trips I have ever taken! So Monday morning I was going to work and fell down the stairs in my apartment building. I bruised my tailbone! Nothing like coming back from vacation and injuring yourself! It was so bad I almost passed out! Very scary! The doctor said there isn't much they can do except manage the pain so they sent me off with a prescription and told me to go buy a doughnut which I refuse to sit on at work but I am using it at home and I seem to be getting better every day. I'm so paranoid of falling again though, it isn't the first time I've slipped and fallen on those damn stairs! Ugg, welcome back to reality...the vacation is definitely over! Alaska was amazing!!! It was hard to leave but at the same time, it feels good to be back in the same time zone! We took LOTS of photos...I will load them all up on flickr soon but here are a few for now! Oh and one more thing...we got engaged!!!! I'll share all the stories soon...for now I am just trying to play catch up and get situated with normal life again. It's a bit of culture shock coming back to NYC!